Shattered Dimensions received fairly positive reviews from critics, with reported aggregate scores averaging 62% to 79% at GameRankings, and Metacritic reporting scores of 76 out of 100 or lower. Reviewers generally praised the idea of bringing four Marvel universes together, and lauded the voice acting. The player can control four versions of Spider-Man, spanning the Amazing, Noir, 2099, and Ultimate universes. During some of the boss battles, Shattered Dimensions switches to a first-person perspective. The player can then use the analog sticks (or the Wii Remote and Nunchuk in the Wii version) to control the given Spider-Man's arms, punching their opponent, but must be prepared to dodge the boss' attacks. The punches can also be modified by holding down certain buttons. Developers described these sequences as a reward for the player. Amazing Spider-Man uses a combination of melee and web-attacks, such as web hammers designed to combine webbing with the environment, mixing up-close and long range combat, and can deals a double damages on the web-based weapon attacks. Spider-Man Noir uses stealth and timing to silently defeat his enemies in combat. When the player is in the shadows the screen turns black and white, signifying concealment. When the player is exposed in light the screen becomes colored meaning the character can be seen. Spider-Man 2099 uses acrobatics and his suit's advanced abilities in combat. He has talons which give him a close combat advantage. He has accelerated vision similar to a spider-reflex which allows him to dodge attacks quickly, much like the two last Sam Raimi's Spider-Man game trilogy series. Ultimate Spider-Man uses the powers of the symbiote suit to devastate enemies, generating symbiotic spikes and tendrils which act like extensions of his own body much like in Spider-Man: Web of Shadows. There is also a rage meter for the Ultimate universe, much like the Spider-Man 3 video game. In Nintendo DS, the playable Spider-Men share the same playstyle. Ultimate Spider-Man does not appear in that version. An artifact known as the "Tablet of Order and Chaos" is shattered into 17 pieces during a brief battle between Spider-Man and Mysterio, who promptly escapes with a piece. Madame Web reveals this blunder sent 12 fragments to three different realities, each with their own Spidey. To restore balance to the multiverse, the Amazing Spider-Man (Spider-Man's main incarnation) is assisted by Spider-Man Noir (Spider-Man's 1930s incarnation), Spider-Man 2099 (the original Spider-Man's worthy successor from a distant future) and Ultimate Spider-Man (Spider-Man's younger incarnation from an alternate present, who is told by Webb to re-bond with a Venom black suit for this quest only) as the fragments landed in their world's. Each Spider-Man easily gains their first tablet fragment and turns it over to Madame Web; however, she explains evildoers will be drawn to the power of the fragments like moths to a flame. "Why'd you have to go and jinx us?" Adding to the bad news, Mysterio's fragment makes his illusions real. The game begins in the Amazing universe, with Amazing Spider-Man pursuing Kraven the Hunter for his tablet fragment. When Amazing Spider-Man confronts him, Kraven uses the fragment's powers to gain super speed. Amazing Spider-Man manages to defeat Kraven and claim the fragment. In the Noir universe, Spider-Man Noir moves through the shadows to claim a fragment from Hammerhead. When confronted, Hammerhead uses it to fuse his guns to his arms, and decides to use his new powers to overthrow his boss. Spider-Man Noir manages to defeat Hammerhead and claim his fragment. In the 2099 universe, Spider-Man 2099 chases Hobgoblin through the city; cornered, Hobgoblin uses the fragment to amplify his psy-powers. Spider-Man 2099 eventually defeats Hobgoblin and claims the fragment. In the Ultimate universe, Ultimate Spider-Man battles Electro at a nearby dam where Electro uses the fragment to grow larger and make minions to fight Ultimate Spider-Man. Ultimate Spider-Man tricks Electro into attacking a dam which releases water, shorting out Electro's powers. Ultimate Spider-Man then claims his fragment. Meanwhile, Mysterio is robbing the museum with his new powers when his fragment shows him the Spider-Men giving their fragments to Madame Web. Craving more power, Mysterio leaves to find Madame Web. Each universe represented in Spider-Man: Shattered Dimensions features unique villains and a unique art style. Amazing Spider-Man then finds a fragment in the clutches of Sandman at an abandoned quarry owned by Roxxon Industries. Sandman uses the fragment's power to take over the quarry and create minions, which he uses to attack Amazing Spider-Man. Amazing Spider-Man defeats Sandman with the use of water, claiming his fragment. Spider-Man Noir pursues Vulture through the streets; Vulture's fragment grants him teleportation powers. When he finally faces Vulture, Spider-Man Noir defeats him by exposing him to light, then claims the fragment. Spider-Man 2099 chases Scorpion for a fragment stolen from the Public Eye; it allows Scorpion to lay eggs that hatch into smaller clones of himself. Scorpion explains that he was hired to steal it so that he could be human again, right before Spider-Man 2099 traps him under debris and claims the fragment. Ultimate Spider-Man is challenged to appear on Wade Wilson's reality show: Pain Factor. He maneuvers through an off-shore oil rig, which has been converted to a television set, while fighting Deadpool's fans, destroying cameras and evading tidal waves. Deadpool gives him the fragment for winning, wondering what it does; Ultimate Spider-Man explains, only to realize the fragment is a prop. Deadpool uses the real fragment, creating two clones of himself, each duplicate with a different weapon and same mind. Ultimate Spider-Man defeats Deadpool and claims the fragment, but is left confused as to how he's going to get home. In the Amazing universe, Madame Web receives the four fragments. Mysterio attacks, threatening to kill her if Amazing Spider-Man doesn't bring him the other fragments. Amazing Spider-Man finds the next fragment in a construction yard; unfortunately, Juggernaut is chased through by Silver Sable's Wild Pack, getting the fragment stuck underfoot. Amazing Spider-Man isolates Juggernaut from them, hoping to get the fragment; however, Juggernaut uses it to become stronger, at the cost of increased vulnerability. Amazing Spider-Man defeats Juggernaut and claims the fragment. In the Noir universe, the Goblin uses a fragment to become monstrous. After a battle under a circus tent, Goblin is defeated and Spider-Man Noir claims his fragment. In the 2099 universe, Spider-Man 2099 encounters Doctor Octopus, head of Alchemax's Shadow Division, and the one who hired Scorpion. Driven insane by the fragment, she plans to use it to power a one-of-a-kind reactor. Spider-Man 2099 shuts down the reactor and claims the fragment. In the Ultimate universe, S.H.I.E.L.D. has acquired a tablet fragment and Carnage in the Triskelion; however, attempting to create a new energy source, they make the mistake of attempting to combine the two. Carnage escapes, draining the life from the S.H.I.E.L.D. agents and using the fragment's power to turn them into his minions. When Ultimate Spider-Man arrives, and to his horror, the Triskelion is already under Carnage's control. Ultimate Spider-Man stops Carnage with the help of reprogrammed Spider-slayers. After Carnage is defeated, Ultimate Spider-Man claims his fragment. Despite Amazing Spider-Man's efforts, the tablet reconstructs itself and is absorbed by Mysterio; effectively now a god, he shatters all the borders separating the other realities, planning to build a new one under his sole rule. The Spider-Men, teleported to their location by Madame Web, defeat Mysterio and separate him from the tablet. As Mysterio tries to reclaim the Tablet of Order and Chaos, the Spider-Men knock him out. Madame Web then thanks them for saving all of reality. After the others return to their own dimensions and the walls between them are repaired, Amazing Spider-Man takes Mysterio to prison. During the credits, Madame Web is then visited by Spider-Ham who hoped to help save reality but answered Madame Web's call a bit too late. Madame Web is left baffled by his sudden appearance. Four different actors portray the alternate universe versions of Spider-Man, all of whom have previous associations with the character in other media. The primary, present day traditional version of Spider-Man. After a battle with Mysterio in his home universe, the "Tablet of Order and Chaos" was fragmented and sent to several different alternate dimensions. This version of Spider-Man has to contend with the likes of Kraven the Hunter, the Sandman, and Juggernaut before the final confrontation. Neil Patrick Harris previously provided voice work as Spider-Man in 2003's short-lived Spider-Man: The New Animated Series that spun out of the 2002 film. An alternate version of Parker from a dimension referred to as the "Noir Universe." Taking place in 1933, this version of Spider-Man has a darker personality and a more brutal fighting style, with a greater emphasis on stealth. Over the course of his involvement in the story, he is forced to face off against Noir versions of villains Hammerhead, Vulture, and Norman "the Goblin" Osborn before joining the other Spider-Men to battle Mysterio. Barnes is best known to Spider-Man fans as the actor who provided the voice for the title character in 1994's animated Spider-Man TV series. He would go on to play Spider-Man 2099 in the Shattered Dimensions sequel, Edge of Time. A younger, only slightly altered variation of Parker from a dimension known as the "Ultimate Universe," this version of Spider-Man is fitted with a black symbiote suit that is controlled by Madame Web, which enhances his aggression and pre-existing super strength. In his universe, Ultimate Spider-Man is forced to face off against Electro, Deadpool, and Carnage before joining the final battle. Keaton's previous associations with the role of Peter Parker/Spider-Man include playing him in the animated TV series The Spectacular Spider-Man, as well as other video games like Marvel Super Hero Squad and Marvel vs. Capcom 3: Fate of Two Worlds. He also went on to play the traditional version of the character in the Shattered Dimensions sequel, Edge of Time. A different character who took up the mantle of Spider-Man in the future, O'Hara is forced to contend with the machinations of the evil Alchemax corporation in addition to facing off against future versions of Spider-Man enemies. These include Hobgoblin, Scorpion, and Doctor Octopus. Gilvezan's previous association with Spider-Man was in playing the title role in the 1981 animated series Spider-Man and His Amazing Friends. Spider-Man's original co-creator along with artist Steve Ditko, Lee returns to narrate the story of the video game for the first time since 2001's Spider-Man 2: Enter Electro. Additionally, several actors return to reprise roles from elsewhere in Spider-Man and Marvel Comics media. John DiMaggio reprises his role as Hammerhead from The Spectacular Spider-Man in Noir form. Steven Blum (the voice of several characters in The Spectacular Spider-Man as well as Wolverine in various media outlets) voices Hobgoblin 2099, Noir Vulture, Vulture 2099, and Silvermane 2099. Jim Cummings (Shocker's voice in Spider-Man: The Animated Series) voices Kraven the Hunter, Noir Goblin, Noir Boomerang and Tinkerer. Thomas F. Wilson (Sergeant Stan Carter's voice on The Spectacular Spider-Man) voices both versions of Electro. Nolan North reprises his role as Deadpool from Hulk Vs.
Fred Tatasciore reprises his role as the vocal effects of Carnage from Spider-Man: Friend or Foe and Marvel: Ultimate Alliance 2. Jennifer Hale reprises her role as Silver Sable from Ultimate Spider-Man and Spider-Man: Friend or Foe while also voicing Noir Calypso. John Kassir (Deadpool's voice in X-Men Legends II: Rise of Apocalypse, Marvel: Ultimate Alliance and Marvel: Ultimate Alliance 2) voices Scorpion and a couple of Deadpool's fanboys. Tara Strong (Christina in Spider-Man: The New Animated Series) voices Doctor Octopus 2099. James Arnold Taylor (who voiced Spider-Man in Spider-Man: Friend or Foe and Spider-Man: Battle for New York, Mysterio in Spider-Man 2, and Electro in Ultimate Spider-Man) voices different miscellaneous thugs and henchmen throughout the game. Other cast members include David Kaye as Mysterio, Dimitri Diatchenko as Sandman, Matt Willig as Juggernaut, and Susanne Blakeslee as Madame Web. Despite not being credited for the role, Chris Edgerly was identified as the voice of Spider-Ham. Jamie Thomason, the voice director from The Spectacular Spider-Man series, directed the actors. Jim Dooley composed the game's orchestral score. Spider-Man: Shattered Dimensions was unveiled on March 30, 2010, where two of the universes, Amazing and Noir, were revealed. The third universe, 2099, was revealed on June 8, 2010. The final universe, Ultimate was first shown to players at San Diego Comic-Con 2010. Beenox made each universe feel unique by creating an individual art style for each universe and giving each Spider-Man different gameplay mechanics. For example, the Amazing and Ultimate universes are rendered with bright colors and tones of cel shading, the difference being that the Amazing universe was given a traditional comic feel based on those of 1900s classic comic book art styles, while the Ultimate universe was given a modern comic feel as of the early 2000s - onward comic book releases. In contrast, the Noir and 2099 universes are rendered with realistic graphics, with 2099 universe was given a futuristic feel while the Noir universe was given a "very dark, very gritty" feel. Noir Spider-Man uses stealth-based tactics on his enemies, similar to the Tom Clancy's Splinter Cell series, and 2099 Spider-Man uses free fall sequences. The developers also worked closely with Marvel Comics to create new versions of characters not seen before in a particular universe, such as Hobgoblin 2099, Hammerhead Noir, and Doctor Octopus 2099. The story for the game was written by Amazing Spider-Man writer Dan Slott and later provided him with an inspiration for the Spider-Verse comic book crossover event, which saw dozens of Spider-Men from alternate realities teaming up. A number of costumes from different universes could be either unlocked early or downloaded by pre-ordering the game from various vendors. GameStop offered for a limited time a Cosmic Spider-Man bonus for the PlayStation 3 and Xbox 360 consoles, which brings a Cosmic Spider-Man outfit to each of the given dimensions. It was later included as a free bonus on the PC version, along with some minor fixes, which were not patched on the console versions. Players could unlock Iron Spider-Man early for the 2099 universe by pre-ordering at Amazon.com. Additionally, players received a book containing concept art for the game. A Scarlet Spider early unlock was offered at Kmart and applied only to the Amazing universe. Finally, pre-ordering at Best Buy rewarded players with the Negative Zone costume in the Noir universe as an early unlock. Wal-Mart.com offered a 20-page comic book with a pre-order of the game. On October 9, 2010, an announcement was made stating that the previously GameStop-exclusive Cosmic Spider-Man costumes would be made available as downloadable content in the latter half of October 2010. The costume was released for the Xbox 360 on October 28, 2010, and was released for the PlayStation 3 on November 2, 2010. The game and the DLC was removed from PlayStation Store and Xbox Live online store, along with other Activisions' Marvel games in 2014. Later, it was re-released in Steam on 24 October 2015. In the Nintendo DS version of Spider-Man: Shattered Dimensions, several changes are more apparent in comparison the other consoles. Spider-Man encounters Electro and Tinkerer as well. Spider-Man Noir encounters Boomerang and Calypso but does not encounter Vulture. Spider-Man 2099 encounters Silvermane and Vulture. Finally, Josh Keaton voices the Amazing Spider-Man in this version as there's no Ultimate Spider-Man in this version. Spider-Man learns Mysterio is after the Tablet of Order and Chaos, which was unearthed at a construction site. Mysterio uses the Tablet as a shield, forcing Spidey to try pulling it away with webbing; he ends up tearing half of it from Mysterio's grasp. Mysterio escapes the Amazing universe, with Spider-man left holding a fragment. Madame Web informs Spider-man of the chaos his inflicted on the multiverse thanks to his blunder; he is to team up with Spider-Men from a past unlike his and a future that may now not come true. In the Noir universe, Spider-Man confronts Boomerang who is stopped by Spider-Man before even getting the fragment. In the 2099 universe, Spider-Man confronts Vulture who uses a fragment so his wings could shoot bullets. In the Amazing universe, Spider-Man confronts Tinkerer who uses a fragment to power up a machine that created an army of robots. In the Noir universe, Spider-Man confronts Calypso who uses a fragment to raise the dead. In the 2099 universe, Spider-Man confronts the now cyborg Silvermane who uses a fragment to be immortal. In the Amazing universe, Spider-Man confronts Electro who uses a fragment to boost his speed. Then the Amazing Spider-Man confronts Mysterio who uses the last fragment to become a god that created a new dimension, which threatens to destroy the others with its existence. Spider-Man defeats him and gives the tablet to Madame Web. The game received mostly positive reviews from critics. GameRankings and Metacritic gave it a score of 74.50% and 73 out of 100 for the DS version; 77.95% and 74 out of 100 for the PlayStation 3 version; 79.16% and 76 out of 100 for the Xbox 360 version; 75.30% and 75 out of 100 for the Wii version; and 62.50% and 68 out of 100 for the PC version. IGN gave the PS3 and Xbox 360 versions eight out of ten and said, "Spider-Man: Shattered Dimensions has a lot of great things going for it",  but scored the Wii version half a point lower despite being nearly identical to these two versions due to finnicky camera controls. Game Informer awarded it 8.5 out of 10 and said it "delivers a non-stop action ride with something new around every corner." GamesRadar gave it three-and-a-half stars out of five and said "Shattered Dimensions is a good game, but it fell short of an Ultimate Marvel Team-Up." GamePro gave the Xbox 360 version four and a half out of five stars and said, "Thankfully, [Spider-Man's] latest adventure, Shattered Dimensions, is one of his best yet, offering four unique worlds, classic Spidey action, and an engaging story that puts it near the top of the franchise both in terms of quality and impact." X-Play gave the game four stars out of five and said it "streamlines the usual trappings of the genre to focus on combat and personality. It’s true that the linear gameplay and old-school combat sensibilities don’t put it on par with Arkham Asylum, but the game succeeds regardless. It’s fun, fast-paced, and long enough to make it well worth checking out." 1UP.com gave it a B and stated, "The change in combat options is a welcome addition, I just wish that the story had delivered on the comic legacy of one of Marvel's more enduring heroes." Non video-game publications gave some strong praise for the game. The A.V. Club gave the Xbox 360 version a B+ and stated: "Filled with countless remember-when moments—as in “Remember when you outran that wave of sand?”—Shattered Dimensions is less literary and artful than Batman: Arkham Asylum, but it’s far more fun." The Daily Telegraph gave it seven out of ten and stated, "The combat, and it's worth noting that this makes up the majority of the game, is superb. It's not particularly deep nor clever, but it's immensely rewarding, as too are the scripted first person sections which exist purely to, yes, let you punch things in the face." However, The Escapist gave the Xbox 360 version three stars out of five and said, "Creative set-pieces and an awesome concept can only hide a repetitious game structure for so long - and the stealth sections that mix it up are just frustrating." The Nintendo DS version of the game drew mixed reviews. IGN and Digital Chumps praised the visuals. IGN felt the visuals stayed true to the comics, while Digital Chumps the smooth and detailed animations. Reviewers felt that overall the 2.5D Metroid-style gameplay was enjoyable, and fit the DS well. Sounds and voice acting were also praised. Some reviewers felt the game was too short, and that not enough emphasis was put on exploring the open world. 1 2 3 4 5 6 Gaskill, Jake (2010-07-23). "Neil Patrick Harris Spidey-Suits Up For Spider-Man: Shattered Dimensions". G4TV. Retrieved 2010-07-02. ↑ "Beenox announcement via Twitter". Beenox via Twitter. 2010-07-27. Retrieved 2010-07-27. 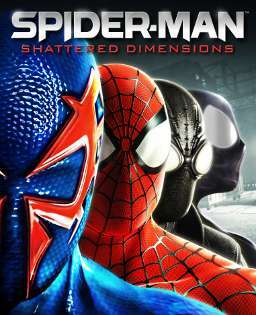 ↑ "Shattered Dimensions PC version dated". New Game Network. 2010-11-12. Retrieved 2010-11-12. ↑ Campbell, Evan (October 1, 2010). "Spider-Man: Shattered Dimensions (DS) Review". Nintendojo. Retrieved July 13, 2016. The plot sets up a game that is heavily inspired by past 'Metroidvania' titles, complete with a slick presentation. ↑ Torres, Ricardo (2010-03-30). "Spider-Man: Shattered Dimensions First Look". GameSpot. Retrieved 2010-03-30. 1 2 3 4 Miller, Greg (2010-07-21). "SDCC 10: Spider-Man: Shattered Dimensions Preview". IGN. Retrieved 2010-07-21. ↑ Fleming, Ryan (2010-06-22). "Spider-Man: Shattered Dimensions First Look". Digital Trends. Retrieved 2010-08-09. ↑ Hinkle, David (2010-08-31). "Spider-Man: Shattered Dimensions DS Preview: Hand not held". Joystiq. Retrieved 2010-09-01. ↑ McElroy, Griffin (2010-07-22). "Final, Ultimate Spider-Man: Shattered Dimensions universe revealed". Joystiq. Retrieved 2010-07-22. 1 2 3 4 George, Richard; Schedeen, Jesse (2010-08-23). "The Deadly Villains of Spider-Man: Shattered Dimensions". IGN. Retrieved 2010-08-24. ↑ "Spider-Man: Shattered Dimensions Full Cast and Crew on IMDb". Internet Movie Database. Retrieved February 21, 2015. ↑ Dar, Taimur (2010-07-23). "SDCC 2010: Spider-Man: Shattered Dimensions". newsarama.com. Retrieved 2010-07-23. 1 2 Torres, Ricardo (2010-03-30). "Spider-Man: Shattered Dimensions First Look". GameSpot. Retrieved 2010-07-30. ↑ Reeves, Ben (2010-06-08). "Spider-Man 2099 Revealed In New Shattered Dimensions Trailer". Game Informer. Retrieved 2010-07-30. 1 2 3 McGarvey, Sterling (2010-07-23). "Comic-Con 2010: Spider-Man: Shattered Dimensions Interview". G4TV. Retrieved 2010-07-31. ↑ "Universes Collide Interview". GameTrailers. 2010-04-05. Retrieved 2010-07-30. ↑ Chester, Nick (2010-03-31). "Spider-Man: Shattered Dimensions gets 'cosmic' pre-order". destructoid.com. Retrieved 2010-03-31. ↑ "Amazon.com - Spider-Man: Shattered Dimensions". Amazon.com. Retrieved 2010-07-20. ↑ McWhertor, Michael (2010-07-23). "Spider-Man: Shattered Dimensions' Hidden & Obscure Costumes". Kotaku. Retrieved 2010-07-23. ↑ "Spider-Man: Shattered Dimensions Pre-Order information". Marvel Comics. Retrieved 2010-07-23. ↑ McElroy, Griffin (2010-10-09). "Spider-Man: Shattered Dimensions 'Cosmic' costumes coming this month". Joystiq. Retrieved 2010-10-12. ↑ "Cosmic Spider-Man Xbox Live DLC Pack". Xbox.com. 2010-10-29. Retrieved 2010-10-29. ↑ "Cosmic Spider-Man PlayStation Network DLC Pack". PlayStation.com. 2010-11-03. Retrieved 2010-11-03. 1 2 "Spider-Man: Shattered Dimensions for Xbox 360". GameRankings. Retrieved 2010-12-11. 1 2 "Spider-Man: Shattered Dimensions for PlayStation 3". GameRankings. Retrieved 2010-12-11. 1 2 "Spider-Man: Shattered Dimensions for Wii". GameRankings. Retrieved 2010-12-24. 1 2 "Spider-Man: Shattered Dimensions for DS". GameRankings. Retrieved 2010-12-24. 1 2 "Spider-Man: Shattered Dimensions for PC". GameRankings. Retrieved 2014-04-28. 1 2 "Spider-Man: Shattered Dimensions for Xbox 360 Reviews". Metacritic. Retrieved 2010-12-24. 1 2 "Spider-Man: Shattered Dimensions for Wii Reviews". Metacritic. Retrieved 2010-12-24. 1 2 "Spider-Man: Shattered Dimensions for PlayStation 3 Reviews". Metacritic. Retrieved 2010-12-24. 1 2 "Spider-Man: Shattered Dimensions for DS Reviews". Metacritic. Retrieved 2014-04-28. 1 2 "Spider-Man: Shattered Dimensions for PC Reviews". Metacritic. Retrieved 2014-04-28. ↑ Chester, Nick (2010-09-10). "Review: Spider-Man: Shattered Dimensions (PS3, X360)". Destructoid. Retrieved 2014-04-28. ↑ Donlan, Christian (2010-09-08). "Spider-Man: Shattered Dimensions (PS3)". Eurogamer. Retrieved 2014-04-28. 1 2 Reeves, Ben (2010-09-06). "Spider-Man: Shattered Dimensions (PS3, X360)". Game Informer. Retrieved 2010-09-08. 1 2 Noble, McKinley (2010-09-07). "Spider-Man: Shattered Dimensions (X360)". GamePro. Archived from the original on 2010-09-11. Retrieved 2010-09-08. ↑ Card, Ben (2010-09-28). "Spider-Man: Shattered Dimensions Review (PS3, X360)". Game Revolution. Retrieved 2014-04-28. ↑ Watters, Chris (2010-09-08). "Spider-Man: Shattered Dimensions Review (X360)". GameSpot. Retrieved 2014-04-28. ↑ Watters, Chris (2010-09-23). "Spider-Man: Shattered Dimensions Review (PS3)". GameSpot. Retrieved 2014-04-28. ↑ "Spider-Man: Shattered Dimensions Review (X360)". GameTrailers. September 13, 2010. Retrieved 2014-04-28. ↑ Workman, Robert (2010-09-13). "Spider-Man: Shattered Dimensions review (PS3, X360)". GameZone. Retrieved 2014-04-28. ↑ Bakehorn, Cliff (2010-10-18). "Spiderman: Shattered Dimensions (DS) review". GameZone. Retrieved 2014-04-28. 1 2 Goldstein, Hilary (2010-09-07). "Spider-Man: Shattered Dimensions Review (PS3, X360)". IGN. Retrieved 2014-04-28. 1 2 3 4 5 Gallegos, Anthony (2010-09-08). "Spider-Man: Shattered Dimensions DS Review". IGN. Retrieved 2014-04-28. ↑ Goldstein, Hilary (2010-09-07). "Spider-Man: Shattered Dimensions Review (Wii)". IGN. Archived from the original on 2010-09-11. Retrieved 2014-04-28. ↑ McElroy, Justin (2010-09-13). "Spider-Man: Shattered Dimensions review: Mo' spiders, mo' problems (X360)". Joystiq. Retrieved 2014-04-28. ↑ "Spider-Man: Shattered Dimensions". Nintendo Power. 258: 90. November 2010. ↑ Osborn, Chuck (2010-09-11). "Spider-Man: Shattered Dimensions review". Official Xbox Magazine. Retrieved 2014-04-28. ↑ "Spider-Man: Shattered Dimensions". PC Gamer: 68. April 2011. 1 2 Jones, Scott (2010-09-13). "Spider-Man: Shattered Dimensions (X360)". The A.V. Club. Archived from the original on 2010-10-14. Retrieved 2014-04-28. 1 2 Funk, John (2010-09-23). "Review: Spider-Man: Shattered Dimensions (X360)". The Escapist. Retrieved 2014-04-28. ↑ Gilbert, Henry (2010-09-07). "Spider-Man: Shattered Dimensions review". GamesRadar. Retrieved 2014-04-28. ↑ D'Aprile, Jason (2010-09-07). "Spider-Man: Shattered Dimensions Review (PS3, X360)". X-Play. Retrieved 2010-09-13. ↑ Brown, Michael (2010-09-08). (PS3, Xbox 360) "Spider-Man: Shattered Dimensions Review" Check |url= value (help). 1UP.com. Retrieved 2014-04-28. ↑ Raze, Ashton (2010-09-14). "Spiderman: Shattered Dimensions video game review". The Daily Telegraph. Retrieved 2014-04-28. 1 2 3 McGehee, Stephen (2010-09-23). "Spider-Man: Shattered Dimensions (NDS)". Digital Chumps. Retrieved 2010-09-24. 1 2 Ronaghan, Neal (2010-09-21). "Spider-Man: Shattered Dimensions". Nintendo World Report. Retrieved 2010-09-24.